Bryan Petersen was only 25 years old when he was named the interim head coach of the Kirkwood men's basketball team in March of 2013. He quickly shed the "interim" tag after running the program for a year and the awards have been rolling in ever since. 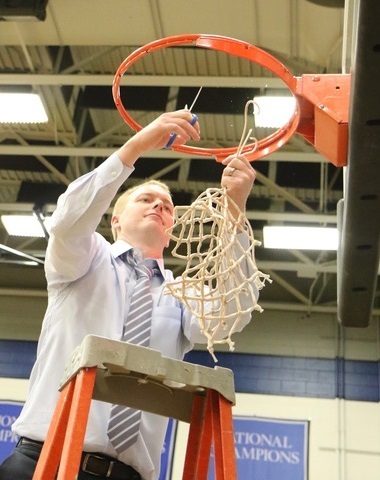 Petersen, 31, was named the 2019 Spalding D-II Men's Basketball Coach of the Year Friday for the second time in his career after leading the Eagles to the junior college national title last month. Petersen also was saluted as the Spalding Coach of the Year after guiding Kirkwood to the 2016 national crown, giving him two national titles and two Coach of the Year awards in four years. "I am honored to receive the coach of the year award," Petersen remarked. "There are many great coaches out there and to receive the award is very humbling. "All the credit goes to my staff of excellent coaches and also our great athletes," he said. "We were lucky as a coaching staff to have such a great group of kids that really cared about each other and bought into improving every day as a team. "We challenged our group to compete every day and give their best, and they did. I am very thankful to them for buying into that message." Petersen has compiled a 157-38 record at Kirkwood for a success rate of 80.5 percent in 195 games. When Kirkwood won the national title in 2016, Petersen became the only coach in the history of the D2 national tournament to participate in the event as a player and win the title as a coach. He was an All-American guard for the Eagles from 2005 through 2007, then became a starting guard for the Iowa State Cyclones for two seasons with 64 straight starts. Petersen was a member of the ISU coaching staff for three years, including one year for current Creighton coach Greg McDermott and two years for current Nebraska coach Fred Hoiberg. He returned to Kirkwood as an assistant coach for Doug Wagemester in 2012-13 and succeeded Wagemester as head coach the following year. Petersen, a native of Clinton, lives in Cedar Rapids with his wife Renae. He received his master's degree from Iowa State in 2012. Kirkwood sophomore Doug Wilson was named the D-II National Player of the Year on Thursday.